Albion Online – Beginner’s Guide – How to Play A True Sandbox MMORPG? Albion is not an MMO like all the rest, and not just because it's a sandbox. 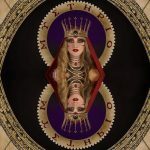 Most people don't know where to start with it, so we hope that our thorough guide will help you through your unique adventure! 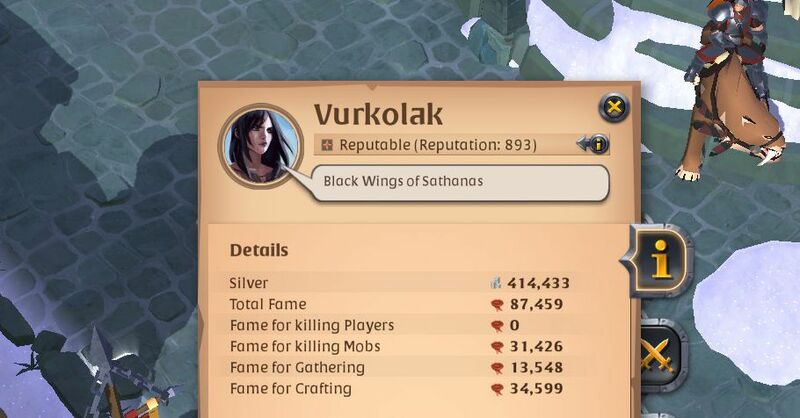 Albion Online is a different MMO. Sandbox at heart – and quite easy for a sandbox to learn how to play – but still unforgiving and realistic as it’s expected. Click here to download Albion Online from the official website. 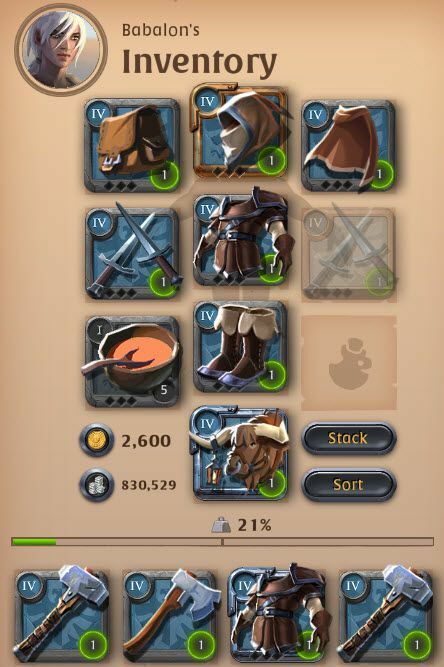 It is suggested that you read through the whole guide, especially if you are just starting out, or if you are considering of starting Albion Online and you’re just not sure about it yet. Character creation in Albion is as simple as it gets (and even though I’m the type that spends 2 hours tweaking every detail, I don’t mind it at all). You simply choose from Male or Female, a preset avatar, and then there’s a few different hairstyles, skin colors, and underwear. The aesthetic simplicity is important, since you’re going to learn how to identify your enemies’ weapons and armor, simply by looking at them. In Albion, there are no player levels. Don’t worry though, as Fame (the game’s term for XP) is gained in hundreds of different skills, making for a unique and rewarding leveling experience. Like in The Elder Scrolls series, you level what you use. So gathering stone will earn you Fame towards leveling your Stone Gathering, while the tools you use to gather it, can be leveled only if you craft more of them! It works the same way with combat, as you level different weapons and armor depending on what you use. For example leveling up your plate chest is something different from your plate shoes – they might as easily be cloth shoes. It sounds a bit complicated at first, but it’s the system that’s responsible for one of the most active auction houses I’ve met in an MMO – it’s a necessity. Everything in Albion (and I mean everything) is divided in Tiers. There are 8 Tiers, with Tier 1 being the lowest, and Tier 8 the highest. To give you a quick example, if you go to a Tier 4 area, you will be able to gather Tier 2 – Tier 4 material and kill Tier 2 – Tier 4 monsters. In order to gather Tier 4 resources, you need to have a corresponding Tier 4 tool, or a Tier 3 one with a big gathering time penalty. What’ more, to get uncommon / rare / epic Tier 4 resources, you need a Tier 4 tool, Tier 3 won’t work at all. Similarly, with Tier 4 armor / weapons you have an advantage over Tier 4 monsters, but still a big disadvantage to Tier 5 ones. 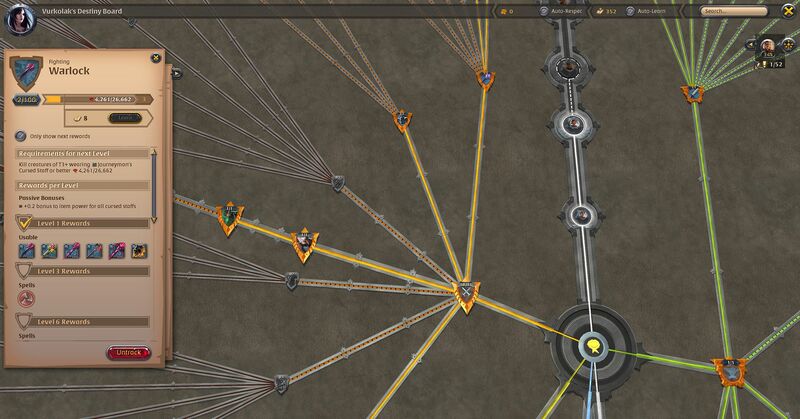 The Destiny Board is the skill tree of Albion Online. It’s huge (though not very hard to decipher), and reminds a lot of Path of Exile, hopefully only on the outside. On the left you have all your fighting skills, and on the right all your crafting skills. That means that you level the left side by fighting, while the right one by crafting. On the bottom you have your gathering & farming skills, which as you guessed you level by gathering resources, and farming plants or breeding animals. If you want to gather wood with a Tier 4 Axe, and you want to craft the axe yourself, you need to level two separate trees. 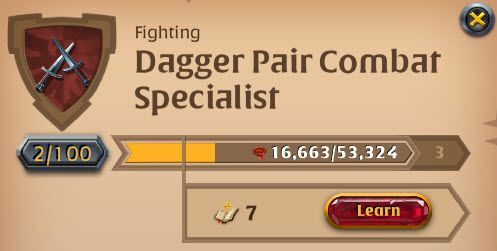 On one hand, you will need to level the Adept Lumberjack skill, for which you will need to gather a lot of resources, and will let you use Tier 4 Axes. On the other hand (and easier to level), if you want to craft your own T4 axe, you will have to level Lumberjack Crafter. (You also need separate skills in order to refine the resources you gather, and use them into crafting). 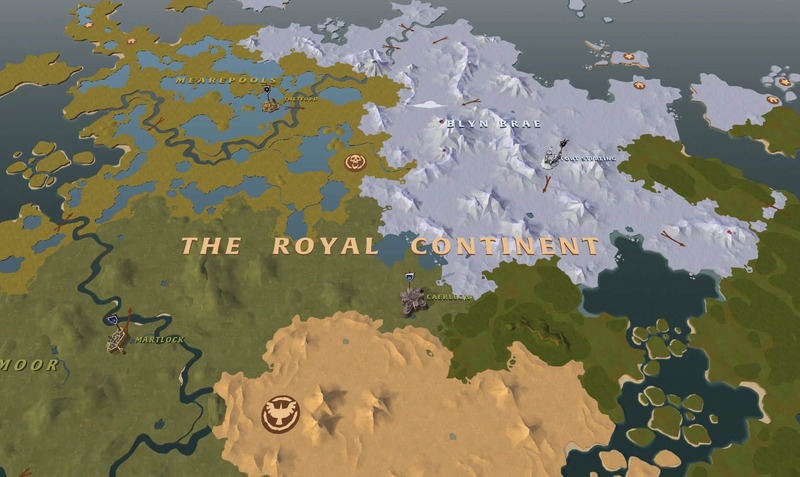 Albion is a world sustained by players. NPCs are almost non-existent, and everything that happens in the world is driven by guilds. 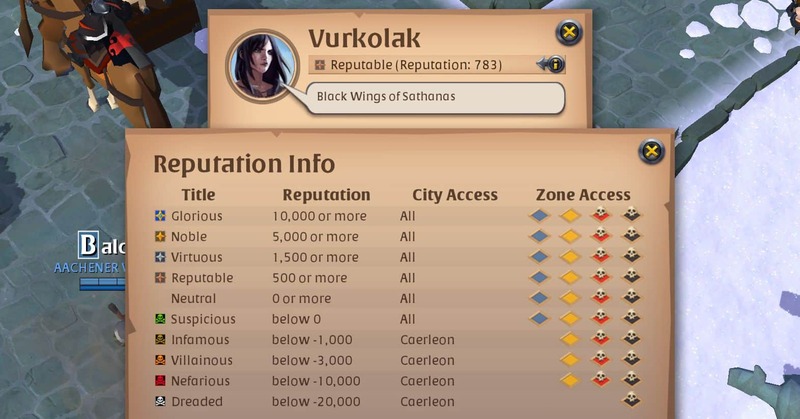 Therefore, the reputation system is directly tied with the world your player lives in, and will restrict your access to certain areas, depending on how well you do with others. 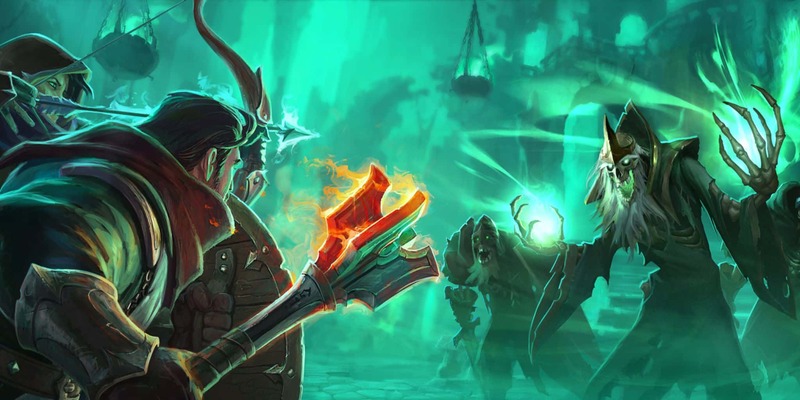 Reputable players will always be able to access all areas and towns, while the more “evil” you become, the less areas you will be able to access, leaving you in the darkest depths of Albion, with the most dangerous foes lurking on each corner! Blue Zones – Towns and Tier 1-4 areas. Yellow Zones – Tier 5 areas. Red Zones – Tier 6-7 areas. Black Zones – Tier 3-8 areas. After you create your character, you will begin in a random starter town. That means that you can’t know which major city is going to be the closest to you, so if you are aiming for a certain one, be prepared for a longer and more dangerous trip, or you could also remake the character till you “get it”, which is kinda lame. Each Major City consists of a Faction as well, which you can enlist for, and raise your standing by doing activities while under the Faction’s flag. Beware though, that means that players flagged for opposite factions can kill you with full loot, even in blue areas. The most important city, Caerleon, sits in their middle, and is the biggest marketplace hub. Caerleon is surrounded by four Tier 6 areas (red regions), which means you can get killed and drop all your loot there. Most people will argue that you want to get there as fast as possible, but you will need at least full Tier 5 equipment if you are going to stand a chance. Last but not least, in the Outlands of Albion, you can only find black zones, which means unlimited PvP without flagging, full loot on death along with equipment worn, as well as no indication on the minimap about how many people are in the same region at that time. Tier 8 zones can only be found in Mercia, the Eastern side of the Outlands. Albion doesn’t have any predetermined classes to choose from like in most MMOs. Instead, each weapon type has its own sub-classes, and each armor type the same, making for an endless number of builds and combinations you can make. Even though the amount of skills, and the size of the skill tree (called Destiny Board) reminds of Path of Exile, the possibilities and the synergies are far more rewarding, reminding of Grim Dawn. There are 3 “main” classes, Warrior, Hunter & Mage, which then break down into different weapons, sub-weapons, and armor types. As mentioned, you are able – and encouraged – to mix & match to your heart’s content, and use weapons and items from different classes in conjunction. The list above is just a simple reference, since the game is much more complicated than that. You can visit this hectic spreadsheet that covers everything you need to know about the different types of weapons and armor, as well as which abilities you can get from which. Item management is realistic in Albion, therefore each town has its own storage and the weight you can carry is limited. Inventory space is not much of a problem in Albion, but inventory weight is! Your character has 48 inventory slots throughout the game, and it’s way more than what you will need to carry around with you (remember that very soon you will be roaming in PvP areas, and if you die you lose everything you carry at the moment). Inventory weight on the other hand is very important, as you will soon realize that the amount of resources you can carry around is very limited. Mounts can help you carry more weight, so make sure to check out the relevant section below. Each major city in Albion has its own bank storage, since moving items between territories is a very important aspect in Albion’s economy, and of course adds to the realism! I really wish more MMOs followed this storage system, like Black Desert Online does too. Your bank’s slot & weight size are very generous, not bound to cause you any issues soon, unless of course you start stacking all kinds of different stuff without having a real plan. Last but not least, you can place a storage chest in your personal island, in order to manage some types of resources easier, and generally have more freedom. What’s more, since you can give access to your island in friends and guildies, and specific access for each separate chest, you can easily see who deposited / withdrawn stuff and when! You need a premium subscription enabled in order to buy an island, but you don’t need one in order to keep using it. As mentioned, storage is not an issue in AO, it’s not a factor of frustration like in 99% of MMOs out there. Instead, the storage aspect focuses into how you are going to manage your weight, as well as your equipment when you are gathering or transporting precious resources! 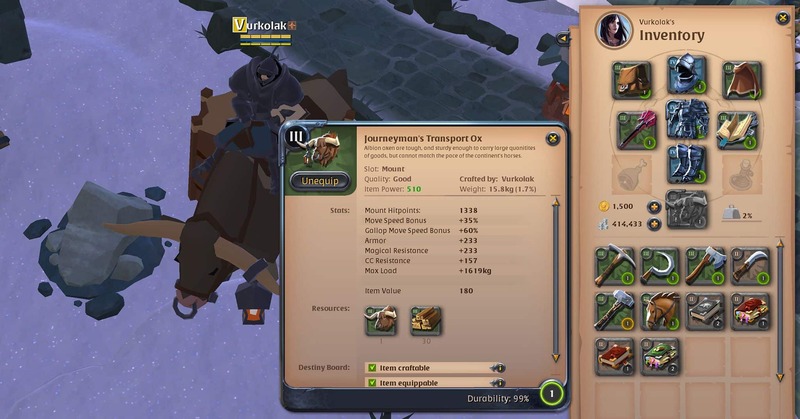 There’s two different types of mounts in Albion, horses and oxen. They both go up to Tier 8, like the rest “items” in the game. Horses are used mainly for fast travel, while oxen are used for grinding resources, as well as transferring resources from place to place, since they can carry a lot of weight in their vicinity. You will get your first mount (Tier 2 Horse) while following the game’s main quest. In order to get a Tier 3 Horse, you will have to buy a Journeyman’s Riding Horse directly from the market (since you need to have a pasture on your island, and that comes way later), but it’s the best investment you can make in the game early on. 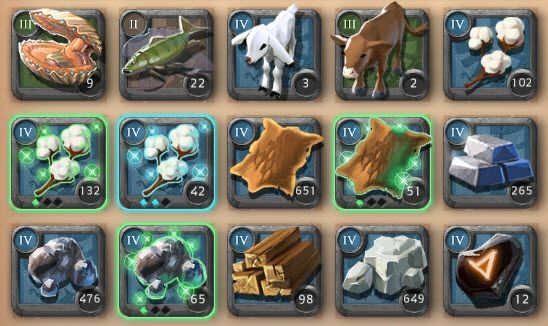 Getting an ox is even harder early on, since you need the Harvester skill from the Farming skill tree, and to get that you will need to harvest carrots from your private island’s farm. What’s worse, is that in order to plant, and then harvest carrots, you will need a Level 2 island. All together, everything will cost you more than 50K (which is hard to get when you are new to the game), and a few hours of grinding. 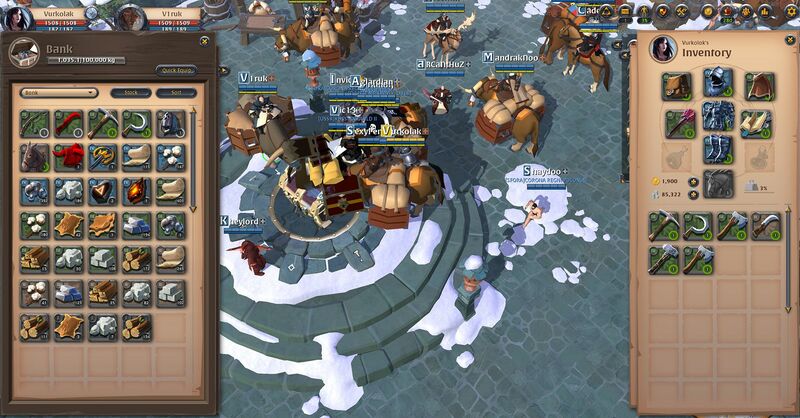 It’s obvious that the crafters will want to aim for an ox as soon as possible, as it will make your farming runs almost 10 times more profitable. Beware though that their low speed, make them a dangerous choice when you are farming in PvP areas, so going back and forth with a horse might prove more profitable (depends on how well you can fend off for yourself, and obviously how crowded the current area is). Let me begin by mentioning that you can buy a premium subscription simply by playing the game, and never using any real money (apart from buying the game in the first place of course). Let me also mention that you can achieve that without making Albion your second job, but simply being smart and strategic about it. This is enough to get the Pay to Win argument out of the way, since there is none here. Of course buying the premium subscription with in-game currency is going to take a big chunk of your Silver, so it’s up to you if you would rather just pay the money (it’s roughly 10$ per month). I can’t argue about the subscription’s necessity and how “forced” it is, since to be honest it’s quite cheap compared to any MMO on the market, and since you can grind it without much hassle if you are active in the game. It’s very important to note, that the premium subscription is character-bound, therefore if you’d want “full production” and you love having alts (max number of alts is 3), you need a different one for each character. Sounds lame at first, but knowing how Albion works it makes big sense, and you don’t really need alts unless you know exactly how you are going to take advantage of them. You will notice that each Skill on the Destiny Board, has a little book saying “Learn” below the Fame progress. These are the Learning Points you need, in order to instantly max the fame needed for the next level of the skill, and you can only get 20 of them daily, by having an active premium subscription. They can be pretty helpful for example when you need to level a particular skill to craft something, but you are not doing so much crafting to level it normally. I would advise holding on to them, and try to figure out the best way to invest them as you progress more in AO. Similarly with Learning Points, Crafting Focus is a special “resource”, that only regenerates for premium players. You passively regenerate 10.000 Crafting Focus daily, even when your character is offline. 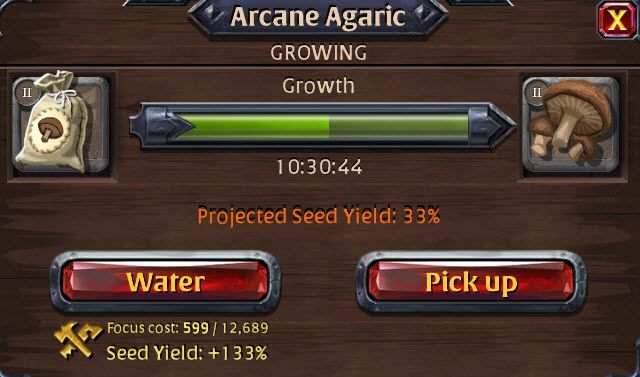 Watering your personal island’s farms, since they will provide a great bonus to extra seed drops (cost depends on the crop you are watering, and your Tier at harvesting this kind of crop). Enhancing the amount of crafted items you get at buildings (cost depends on amount & rarity of the materials used). The game has also kept this model since launch, so it’s safe to expect that they will keep it this way. The premium bonuses are indeed extremely important for faster progress, but the ability to buy it with in-game currency balances out any P2W factor. I would strongly advise grabbing your first premium with real money – as long as you had a few days in the game and you are enjoying it – since it will be quite hard to obtain your first one by grinding in a new account. From then on, it’s easy to plan ahead and always get it with in-game currency if that’s what you want. I’d also suggest that the Epic / Legendary packs of the game are totally worth it, since they will provide you with a few months of premium in an even lower price point. The only negative I might add, is that I don’t really see how AO will be able to sustain financially with this model, so my hopes are left with the community! 16-hours / day in front of the screen entrepreneur, of which 6+ are spent on gaming. MMOs, CCGs, RPGs and many more, Steam-addict & achievement-w***e. Currently wasting life on BDO & ESO.